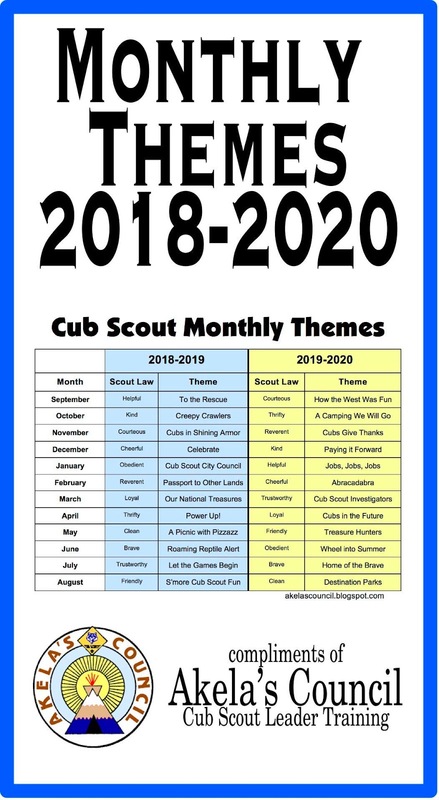 Akela's Council Cub Scout Leader Training: Cub Scout Monthly Themes 2019 and Beyond and Pack Meeting plans for every month's themes!! The BSA is not giving us new themes but have said to choose our own. Originally, BSA said we would use the themes on a 3 year rotation, and that is what I have done here. If this helps you to have themes picked ahead of time you are welcome to use it, or you're welcome to print out a blank one below and fill it in yourself. Look for links below for all the themes above and other ideas for themes you could add. Check back! I will continue to update this page as it will continue to be a work in progress. If you have suggestions on what to add, comment below! If you are willing to donate ideas, we would love to add your ideas and give you credit. We also have many PowWow books we are in the process of digitizing and adding to this blog. We will add links below as we get them added. To open individual monthly planning idea sheets directly off this blog, the Boy Scouts of America website, and other places, click on the links below for the correct theme you are interested in. BSA "A-Camping We Will Go"
BSA "A Picnic With Pizzazz"
BSA "Cub Scout City Council"
BSA "Cubs In Shining Armor"
BSA "Cubs in the Future"
BSA "Friends Near and Far"
BSA "Home of the Brave"
BSA "How the West Was Fun"
BSA "Let The Games Begin"
Our National Treasures - Also See "Home of the Brave"
BSA "Passport To Other Lands"
BSA "S'More Cub Scout Fun"
Thanksgiving - Also See "Cubs in Action" and "Circle the Wagons"
I found another GREAT resource for Pow Wow Books at MacScouter. Click here. July: Loyal – "Scout Salute"
August: Courteous – "S'More Cub Scout Fun"
September: Helpful – "To The Rescue"
October: Kind – "Creepy Crawlers"
November: Courteous – "Cubs In Shining Armor"
January: Obedient – "Cub Scout City Council"
February: Reverent – "Passport To Other Lands"
March: Loyal – "Our National Treasures"
April: Thrifty – "Power Up!" 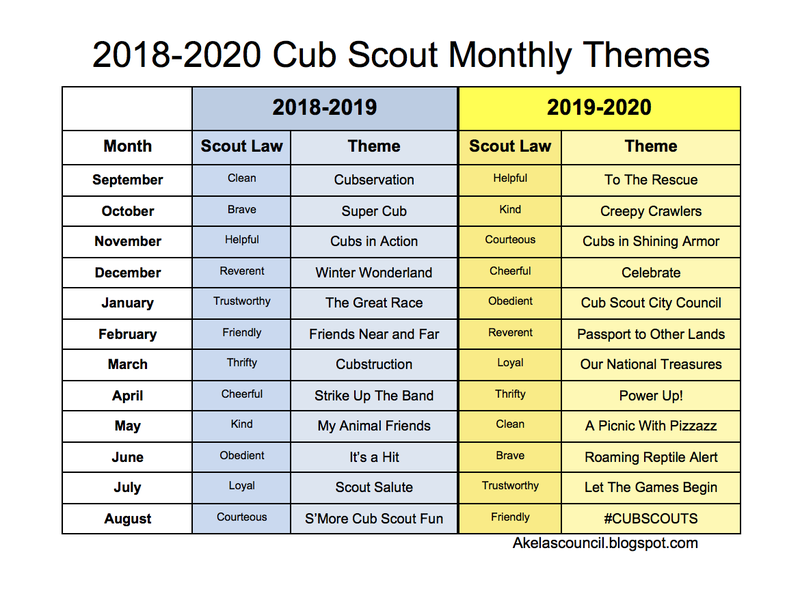 May: Clean – "A Picnic With Pizzazz"
June: Brave – "Roaming Reptile Alert"
July: Trustworthy – "Let The Games Begin"
September: Courteous – "How the West Was Fun"
October: Thrifty – "A-Camping We Will Go"
November: Reverent – "Cubs Give Thanks"
December: Kind – "Paying It Forward"
January: Helpful – "Jobs, Jobs, Jobs"
March: Trustworthy – "Cub Scout Investigators"
April: Loyal – "Cubs in the Future"
May: Friendly – "Treasure Hunters"
June: Obedient – "Wheel Into Summer"
July: Brave – "Home of the Brave"
August: Clean – "Destination Parks"
There is a Leader Book for each of the three groups- Wolf, Bear and Webelos. It is a valuable asset and I highly recommend it. It lays out each of the adventures into three meeting plans. In many cases, by following this plan the boys can complete the adventure in den meeting. The den activities do not really correlate to pack meeting, but with careful planning you can schedule some activies that do correlate. For example, the Carnival is a Bear requirement. We wanted our Bears to do the "Grin and Bear It" adventure the month prior to the carnival so they could make necessary preparations. Hello! When will you have the 2018-2019 planning done? Thank you! National is not putting out new themes for the coming years. I just added a new form above, but only changed one month's theme from the 2015-1018 Themes. What would you like to see changed or added? I'm also adding a lot more ideas above with links to ideas for other themes. What else do you suggest we could do to help others who are looking for new themes? 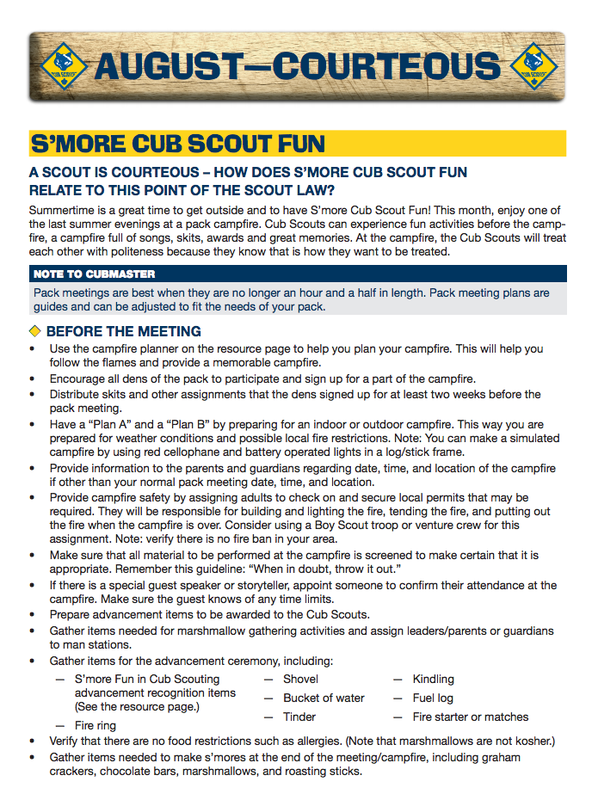 I would like to know when the pack meeting planning guide will be done for 2018-2019. Working on the calendar for the year and would like to have a complete calendar. I was told not to expect it this year and just recycle 2015-2016 themes. My comment - National too busy bringing girls in, and making us take YPT again that they lost sight of the goal - a quality program for the Scouts (both Boys and Girls). I just added a new form above, but only changed one month's theme from the 2015-1018 Themes. What would you like to see changed or added? I'm also adding a lot more ideas above with links to ideas for other themes. What else do you suggest we could do to help others who are looking for new themes?